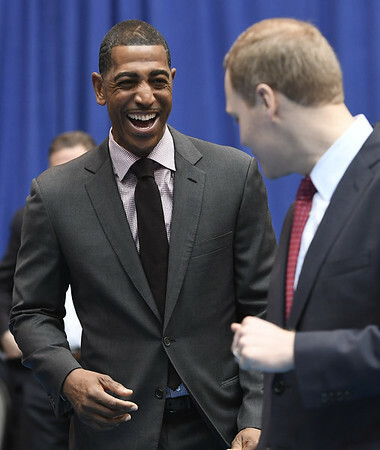 HARTFORD - Former UConn basketball coach Kevin Ollie has brought his $10 million dispute with the school over his firing to both state and federal court. A federal judge in Bridgeport on Friday heard arguments by lawyers for Ollie and the university over a motion that would allow Ollie to move forward with a racial discrimination complaint against the school without jeopardizing his right to an arbitration hearing with UConn over his firing last year. Judge Kari Dooley did not immediately issue a decision, and it's not clear when she will rule. “We remain confident that Coach Ollie will ultimately be able to assert unequal treatment claims at the appropriate time,” said Ollie's lawyer, Jacques Parenteau. Parenteau also filed a motion Thursday in state Superior Court seeking an order that would allow him to depose out-of-state witnesses in the arbitration case - something that could extend that process by months, barring any settlement. “We have spoken to many witnesses with direct knowledge of the claims in this case who were not interviewed by UConn and we are determined to preserve and present testimony that demonstrates UConn has violated Coach Ollie's right to be paid in accordance with his contract,” Parenteau said. The university fired Ollie last March after a 14-18 season, citing NCAA recruiting violations. The school said because the firing was “for cause” it did not have to pay the coach about $10 million left on his contract. Ollie filed an internal grievance seeking that money, which has led to the arbitration. Parenteau argues that UConn was allowed to interview witnesses during the NCAA investigation of alleged violations and it would be unfair not to allow Ollie to depose those people, who can't be compelled to attend the arbitration hearing. “A great majority of these individual reside out of the State of Connecticut and so would not be available to provide relevant and crucial testimony (at the arbitration hearing) favorable to Coach Ollie's case,” he wrote. Messages seeking comment were left Friday for lawyers representing UConn. In federal court, Ollie, who is black, is seeking to preserve his right to file a discrimination complaint before either the state Commission on Human Rights and Opportunities or the federal Equal Employment Opportunity Commission. He plans to argue that he was treated differently than former coach Jim Calhoun, who is white and wasn't fired after being penalized for recruiting violations. The school has refused to waive that clause and argues that Ollie must exhaust his administrative options before taking any other action. Posted in Newington Town Crier, UConn on Friday, 25 January 2019 16:23. Updated: Friday, 25 January 2019 16:26.